Heartworm disease is a potentially fatal condition that affects dogs and cats. Heartworms transmit to a dog or cat via the bite of an infected mosquito. The worms that grow from larvae attack the infected animal’s heart, lungs and pulmonary arteries. When a dog becomes infected with heartworms, the mosquito transmits heartworm larvae that it has carried from an infected dog into the dog's skin via the bite. The larvae burrow beneath the dog's skin, where they go through a molting process twice. The first molting happens one to 12 days after the infected mosquito has transmitted the larvae into the dog's skin. The larvae molt a second time 50 to 68 days after their first molting to become immature worms. The worms travel into a peripheral vein and are carried via that vein to the right ventricle and the pulmonary arteries. After six months, heartworms reach maturity, growing 4 to 12 inches. They can live as long as five years. As many as 250 individual worms may be present in a heavily infested dog in whom the disease has remained unchecked. Females can give birth to as many as 5,000 offspring, called microfilaria, that can remain alive in a dog’s circulatory system for three years. Initial stages of heartworm infection do not typically manifest symptoms. But as the infection progresses, your pet may show signs of fatigue, weight loss, poor appetite and difficulty breathing. Your dog or cat may also begin coughing and gagging. If left unchecked, symptoms increase in severity. Your dog or cat will experience weight loss, rapid breathing and may faint after a brisk walk. The condition is critical if your pet's ribs become prominent and his chest bulges. In its end stage, heartworm disease causes acute vena cava syndrome or an episode of thromboembolism, which leads to collapse and death. A veterinarian diagnoses a heartworm infestation in dogs and cats via a blood test. Unfortunately, a blood test can show inconsistent results in animals who have had heartworm but were rid of them within approximately seven months. Although no FDA-approved heartworm treatment exists for cats, dogs can be treated for heartworms with a combination of injections and antibiotics, the latter of which address any secondary infections. The injections contain arsenic and require a vet's administration. Arsenic is toxic. Its side effects, which include causing blood clots in a dog’s lungs, can be just as serious as the disease it’s treating. Dogs are usually hospitalized during treatment, since veterinarians must monitor them closely. Dogs being treated for heartworms must get plenty of rest; in many cases you must crate the dog for several days to ensure the dog doesn't run and dislodge worms, killing him. Treatment can take up to two months. Some cats can recover from heartworm disease on their own. The cat’s system will try to eliminate heartworms, but the process can lead to life-threatening shock. A dog’s chances for a full recovery from heartworm disease are slimmer when the disease has had a chance to advance. Advanced heartworm disease in dogs can cause irreversible damage to the heart. Even if a veterinarian successfully cures a dog of heartworm disease, the dog will require heart treatment for the rest of his life. Because heartworms damage the heart muscle, infected puppies and ill or elderly dogs present more critical cases than infected healthy adult dogs do. Naturally, an ill or elderly dog will succumb to resulting heart disease faster than a healthy young dog. Dogs can get infected with heartworms after they have successfully been treated for a prior infestation. Since worms have to be in your dog's system for six or seven months before evidence of infection can show up in a blood test, it is important to watch for symptoms. Once they begin manifesting, take your dog to the vet. Talk to your dog’s veterinarian about heartworm tests and heartworm preventative medicine. Preventative medicines include once-a-month chewable tablets for dogs and cats, as well as monthly topical medications. Dogs have the option of receiving shots twice yearly to prevent heartworms. Studies give conflicting reports about the safety of giving heartworm medicine to a dog who has already had heartworm disease, and popular opinion varies as well. 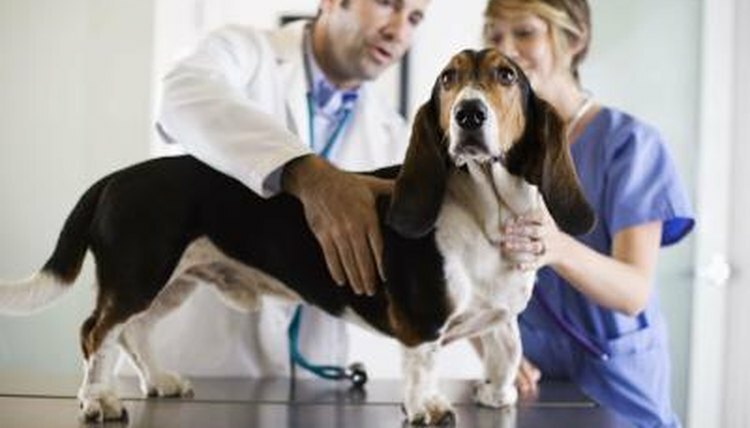 Be sure to address all your concerns with a veterinarian and seek a second opinion.